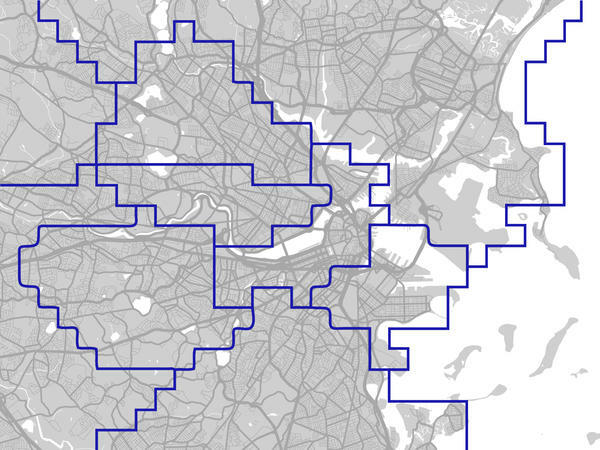 This map, created by Christo Wilson of Northeastern University, shows Uber surge price areas in Boston. Uber prices vary in these sections of the Bay Area, as shown on a map created by Christo Wilson. He found differences in surge frequencies by cities, with San Francisco Uber prices surging 57 percent of the time. Christo Wilson has created this map to show Uber surge areas in Manhattan, where he says prices surge 14 percent of the time. Behind that idea is an algorithm, which promises to keep supply and demand in constant balance, encouraging drivers toward busy areas and tempering customer requests by increasing the price of each ride. It's called surge pricing. Those who have used Uber know that surge pricing is a temperamental beast. It changes quickly, varies seemingly unpredictably and has gotten heat from consumers, regulators and even drivers themselves. Uber says without surge pricing, the whole premise of a ride in minutes falls apart when there's a crush of demand. But how exactly does Uber's algorithm work? The company doesn't say. A team of researchers at Northeastern University decided to find out by doing what they call "algorythmic auditing." "If you go on eBay or Amazon, you can see, these are all the people who are selling the product, these are all different prices," says Christo Wilson, one of those researchers. "But Uber is different. They have this algorithm, and they say it changes prices based on supply and demand, but it's a black box. You have to trust that it's working correctly, because you can't verify. You don't know how many customers there are, you don't know how many other drivers there are." Here's what Wilson and his colleagues, Le Chen and Alan Mislove, did: In simplest terms, they created 43 Uber accounts and wrote a script that logged into those accounts, pinged Uber's servers every 5 seconds (as a regular account would) and recorded the information about Uber drivers in Manhattan and San Francisco. The team tested their tracking methodology on a public database of New York taxis to make sure they could extrapolate information about the vast majority of cars in the fleet. Then they studied Uber cars' comings and goings, and eventually combined that research with Uber's publicly available tools and information to analyze how they correlated with surge prices. Sometimes they do entice more drivers to go to busy areas and sometimes they don't. "[Surge pricing] is working in a sense that it is responding to supply and demand, but I would argue that it's not working as intended," says Wilson, who is an assistant professor in the College of Computer and Information Science. "What we see is that demand drops precipitously, cars stop getting booked and drivers are just sitting there. And actually there's a lot of drivers who drive away from surges ... . If the incentive was working the way it should, you would expect there always to be an incentive for [drivers] to always move in. But in this case, the result is mixed." Uber doesn't dispute the existence of predefined surge areas and the super-fast turnaround of surges, and says both allow the app to quickly calibrate supply and demand. Wilson suggests that it's the short lifespan of a surge price that may create the mixed response from drivers, not giving drivers enough time to respond to the price surges that effectively reflect the demand from 5 minutes earlier. Uber spokeswoman Molly Spaeth tells All Tech that the company has heard its drivers' calls for better ways to make use of the surge prices — to make them work as they are intended. Uber earlier this month revealed a redesigned app for its drivers. One of the elements is meant to help drivers predict where the next wave of customers will be located on an even more granular level than the surge area maps that Wilson's team has figured out, which you can see on this page. "It encourages drivers to go to the neighborhoods with the highest demand, ensuring there's always a ride available within minutes. Contrary to the findings in this report — which is based on extremely limited, public data — we've seen this work in practice day in day out, in cities all around the world."